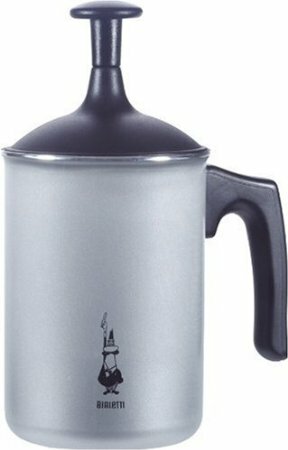 Make espresso in office kitchen- just have a kettle and microwave? I'd like to make espressos for lattes in my offices. However we don't have a stove or coffee maker -- just a kettle and a microwave, and that's about it. Is it possible to make a decent espresso with just these appliances? 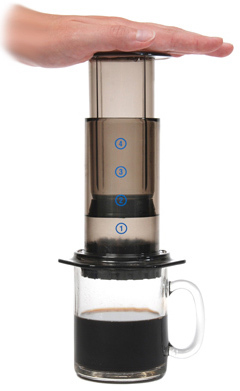 Aeropress will give you a decent coffee extraction. Warm up the milk in the microwave, and use a frother like this one made by Bialetti to achieve a really thick and smooth latte foam. Your other option (as SAJ14SAJ suggests) is an electric Moka maker. I've seen this Bialetti Electric Moka make a decent espresso and last a long time (if instructions are followed). Many Italian households don't own an espresso machine and simply go with a moka maker. Bialetti is very often the moka of choice. A method to push water at a specific pressure, through the grinds. You can solve #1 and #2 by buying your coffee already ground. I would suggest you start with Illy espresso or find a local reputable roaster. I would stay with Illy until you feel comfortable with the other variables. You can solve #3 with your current equipment, but you may want a thermometer. You can boil the water, then let it sit for a few minutes and you should be ok. Regarding #4, that is where you are missing the proper equipment. This is where I would suggest an AeroPress or MyPressi. They have been recommended strongly a number of times. My suggestion is a "starter" suggestion. You are going to find it difficult to make great espresso when you have so many variables to manage yourself. With the above setup, I believe you can make good espresso and that may be good enough. We have an Rancilio espresso maker at our office and about 10% of the people use it properly. The rest of the people do not make a great espresso, but they make "good enough" and they are happy with it. If you want espresso, as officially defined, the Aeropress above won't get you there. This will get you close to it, with the resources you have, plus a minor purchase. If you like it, then it doesn't matter what it is called. True espresso requires special equipment to generate steam and use its pressure to force water through coffee grounds. If you are asking, can you produce espresso strictly with the equipment you already enumerated, the answer is no. Since you have a kettle at your office, you must have a heat source of some type, unless you meant an electric kettle. Even if you only have an electric kettle, now, you could always buy a small electric hot plate. Evidently, electric moka pots are also available (such as this one), which might be suitable for your office and would not require a separate heat source, although I cannot speak to their quality or reliability. Of course, depending on what you mean by latte, you may also require steamed milk, which I am not sure how you would generate without an espresso machine. Assuming, like most of the answers so far, that you want something that is tasty and espresso-like with a minimal investment (e.g., doesn't need to be strictly espresso/latte, or only with what you have), you might consider a "Vietnamese style coffee filter". It's a little metal thing that sits on top of your cup; you put the coffee in, compress it into a puck, and add water. It produces something a bit like if you used a Moka, with the bonus that you don't need a stove (e.g., if you meant that you have an electric kettle) and they are usually cheaper (~ $5). Or you could use a French press - not espresso at all, but also cheap and easy. Sort of between @talon8 and @sleeves on the grounds. I wouldn't buy 'factory-ground' coffee, but if you buy decent beans reasonably often and grind them at the store (or at home), that works out pretty well - and might be preferable to bringing a grinder to work. The point of espresso is that it needs pressure. This is why the different kinds of espresso machines exist - their core functionality is creating this pressure. If you are willing to extend the equipment in your office kitchen, you can create not-quite-espresso fairly cheaply. A portable hob and a Bialetti-style mokka pot together should cost around 50 Euro ($70), maybe more depending on pot size and quality -- a reasonable cost if multiple colleagues chip in. An alternative is to explore coffee options beside lattes. Lattes may be popular at coffee shops which have the proper equipment, but different drinks may be a better solution for your office. You should be able to make cappuccino with drip coffee, and with a portable single-plate stove you can make Turkish coffee and all its derivatives. I have actually boiled coffee in milk instead of water, sticking to the Turkish method in every other detail, and found the result surprisingly good. If you are looking at such hobs, be aware that while induction is convenient (heats up much faster than alternatives), the units on the market often come with a safety feature that prevents you from heating anything with a diameter less than 12 cm, which will rule out moka pots and ibriqs. Piamo - a German company - is making a microwaveable espresso machine. It doesn't appear the device is yet for sale. I've been using it (in some different evolution release...) more than ten years with great results. Use a good coffee brand (Illy is perfect...) for great success. Not the answer you're looking for? Browse other questions tagged coffee espresso or ask your own question. What is a pressurized filter, and should I use it for my espresso? Why isn't my espresso coffee nice and strong? How can I use an espresso maker on an induction cooktop?